The trek starts at Alha. Alha is a village, located 6 kilometres from Dalhousie G.P.O on the Dalhousie-Khajjiar Road. It can easily be reached by bus (leaving for Khajjiar from Dalhousie) or by hitchhiking. This day trek is divided into three distinct sections: a climb through a forest, a walk along the ridge and downhill along a concrete path. The starting point for the trek is the viewpoint on the Dalhousie-Khajjiar Road at Alha. From the viewpoint the track veers off the metalled road and leads to a foot trail. 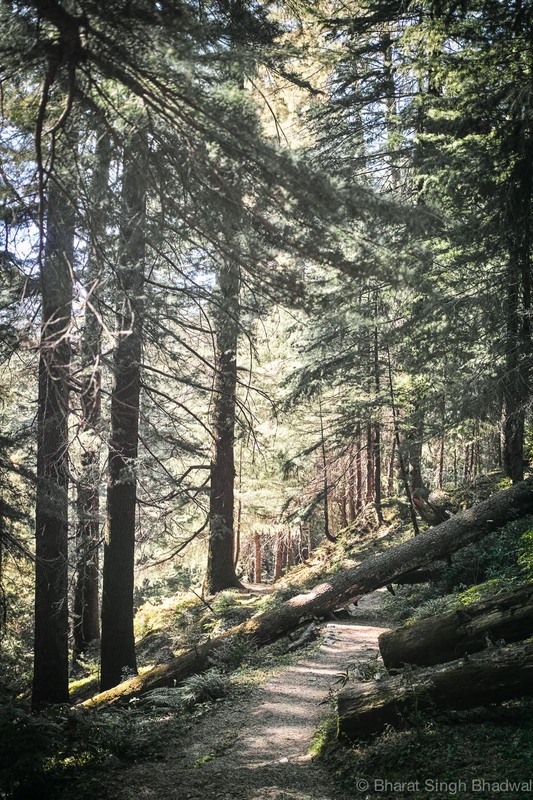 This well marked foot trail winds uphill through a dense forest of fir and deodars. The woods, gently squeeze the trail and there will be times when you will be walking over, or between fallen trees. The woods are pitted with small streams, however, in November these streams had dried off. The trail gains elevation for the next two kilometres and it exits the forest on a ridge near a tea shop. This shop is the right place to relax, and treat yourself to tea, namkeen Mattar (Indian fried snack) and some piping hot besan Barfi (Indian sweet made with gram flour and sugar). There is a clear one and a half kilometre trail along the ridge that leads from the shop to the viewpoint at Dainkund. This route is frequently used by locals to visit the Pholani Devi Temple and the trail winds along the outer wall of the Air Force Station. On this one and a half kilometre stretch the elevation gained is minimal, however, the views from the ridge are mesmerising. At one end of the ridge are wooded hills that lead to Dalhousie, while on the other side the hills extend to tall snow clad mountains. At a few places the trail is squeezed between the ridge and the air force station's outer wall. Exercise caution when traversing these narrow sections, especially with children. The trail ends at a bifurcation near the Dainkund viewpoint. From Dainkund viewpoint, it is a comfortable 0.7 kilometre walk downhill to the vehicle parking lot over a concrete path. Pholani Mata temple at Dainkund. Water - Water is available at the tea shop and at Polani Devi temple. Though a liter bottle may come in handy. Windproof jacket - for walking along the ridge.